The most sought after of all gourmet mushroom varieties. Best cooked, it exudes a rich, smoky flavour with a meaty texture, and is highly acclaimed for its health benefits. Whether served as a side dish or the main event, mushrooms' texture and flavour is very satisfying. Cooked with a little sherry, or sauteed on garlic toast, we love them! Our 'plugs' will provide you with mushrooms for several years. This variety is expensive to buy from the supermarket, but easy to grow yourself. 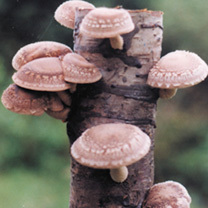 Our 'plugs' will provide you with mushrooms for several years. Supplied as wooden 'spawn plugs' - just find some freshly cut logs (except from pine trees), drill holes in them and push them in. Cropping commences after 4-10 months and continues 3-5 times a year for 3-5 years. Full growing instructions included. Shiitake mushrooms are considered a gourmet variety of the mushroom world. They are quite easy to grow yourself! Our new 'plugs' couldn't be easier, and will provide you with mushrooms for several years.